Jamberry is one of the few books that 2½-year old Ana can recite cover to cover gleefully. The book shows the adventures of a little boy and his friend, a jolly big bear, as they go berry picking. 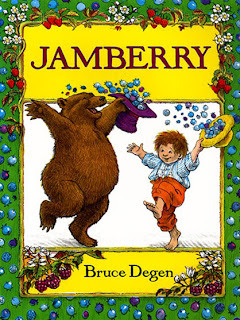 The book was apparently inspired by Degen's own experience going on berry picking escapades with his grandparents and later with his own children. Initially, I was a bit dismissive of this book, jumping to the wrong conclusion that it is a bit mindless and banal, with concocted words for forcing the rhymes. But, as I re-read it a zillion times by request, the book revealed the simple pleasures of childhood when we fully enjoyed what we were doing - not the result our action might produce, not as a means to an end, but, just the adventure itself - which in this case happens to be picking a whole lot of berries to make jam, among other things. I could relate to that, and so could Ana as we go berry-picking in nearby farms every year. The illustrations are charming and have an old-world, idyllic feel to them, yet filled with colorful lively movement. It sometimes seemed a little too busy to my adult eye, but, apparently captivated Ana, encouraging her to pick out all the little aspects depicted in each page: We see the boy and the bear giddy with joy, tumbling in berry fields and canoing in streams down waterfalls, riding a train full of berries, and floating along in a hot air balloon. We see rabbits jamming in the Berryland band and elephants skating on raspberry jam. We see a whole lot of berries everywhere and the general joie de vivre is depicted beautifully - which is what childhood should be all about. The rhymes are delightful, infectious, and musical, although nonsensical and silly sometimes. They start out simple and quickly intensify and get playfully complex, making it a spiffy read-aloud book. Looking for berries, berries for jam. Elephants skating, on raspberry jam. Buried in berries, What a jam jamboree! On the way to daycare, or while shopping for groceries, or even while taking a bath, she would repeatedly chant What a daam daambowee! and giggle, imploring me to start reciting the book in full. Again. This easily falls within the top 5 favorite read-aloud books with Ana. Children will either love it or not care for it - there is hardly room for an inbetween here. Hopefully as they grow older and can read alone, they will love discovering the various subtle touches in the illustrations as Emilie Coulter notes: a frog climbing out of a hat, crackers and butter instead of lily pads, and a sign by the raspberry skating rink asking skaters not to pick the jelly rolls planted nearby. Lovely review Sheela ! I think both my kids will enjoy this book :-). It reminds me of the book "Blueberries for Sal". The title of this book sounds very cute! It just seems like a merry berry treat! I love rhyme and meter and know this shall be fun to read out loud! 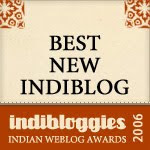 Plus, I am dying to see the illustrations you mentioned to watch out for...esp. the sign by the skating rink! Lovely book Sheela. My son enjoyed it a lot very much. Thanks for your good effort. I loved this book, the first time I read about it here. Bought it a couple of months back and it is a total hit. I love it and my daughter loves it and its fun to hear her say rumble, bramble, clickety. The pictures are so alive.